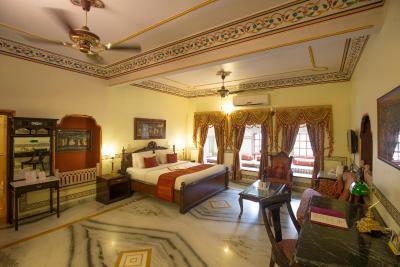 Lock in a great price for Umaid Bhawan - Heritage Style Hotel – rated 8.7 by recent guests! Beautiful property, lovely food and amazing staff. It is stunningly beautiful, breakfast had a lot of options, staff were polite, professional, and helpful. The AC was good, the room was spacious and the bathroom was clean and well-stocked. It was a really lovely stay. All the staff had adequate English skills, they accommodated me with a super late meal and check in, and made me feel welcome as a guest. Almost everything. The building even though was not as large as it seems in the photos, was so exciting and glorious and each floor was different. Our room was on the last floor they gave us the family suite so it was HUGE and all the furniture were original and lovely. The restaurant food was really tasty and good value and all the staff were nice and helpful and respectful. 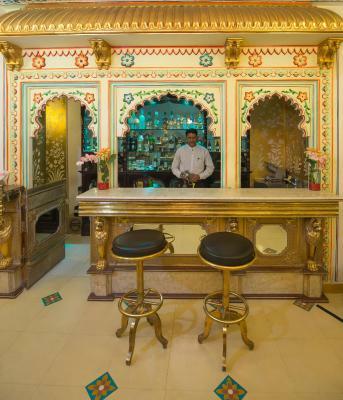 In the chaotic India, it was a well organized hotel, contacted me around reaching station,driver picked us up, food in breakfast was good, very close to center and station. Great neighborhood. I loved the decor and the feel of this place. The staff was very attentive. It was a little noisy being beneath the kitchen area at night. A little further away from things then I would have preferred. But other than that it was a perfect stay. The architecture is absolutely fantastic! 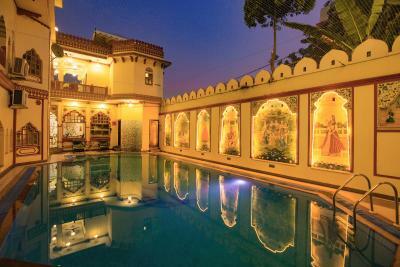 Coupled with great food, a lovely pool and exquisite service, we enjoyed our stay here! The staff was unbelievably personable and client concerned. Service in every aspect was exceptional. In the dining room wait staff gladly and thoughtfully advised on menu choices and how to eat certain meals. 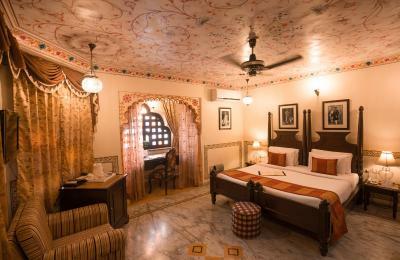 The suite was beautifully appointed and the bed comfortable in clean, crisp linens. Although because of time constraints I couldn't avail myself of the class, the yoga room and class looked peaceful and inviting. 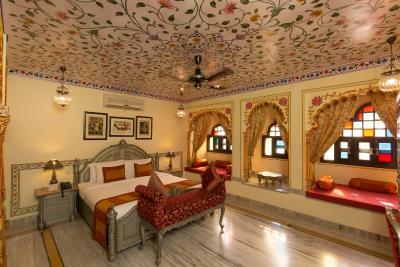 The rooms were incredible, spacious and beautiful. The shower was hot which is a rarity in India. 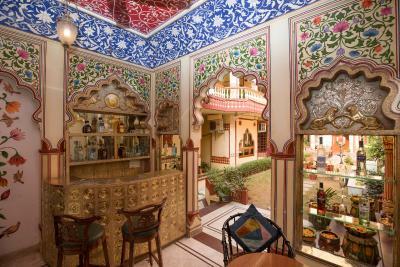 This hotel is very Indian style and very luxurious. 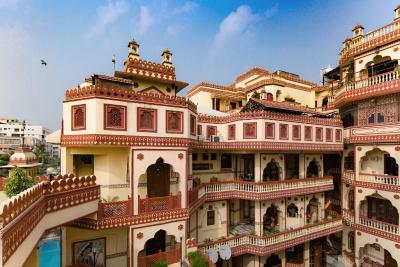 We are surprised when we see our hotel, especially the decorations and outlooking. Staffs there are very nice, the breakfast is also very good. 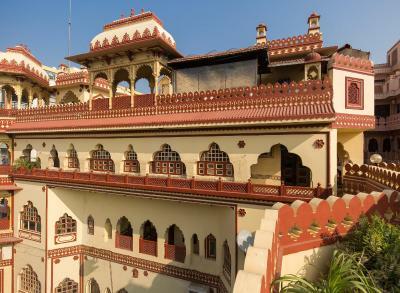 We have our breakfast at the building top that morning, I really enjoy the sunshine and cool wind at Jaipur. Very good! 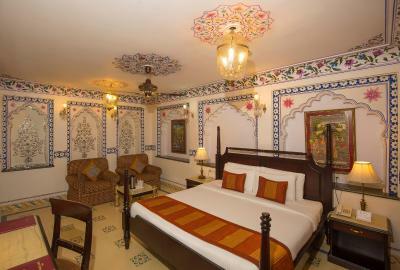 Umaid Bhawan - Heritage Style Hotel This rating is a reflection of how the property compares to the industry standard when it comes to price, facilities and services available. It's based on a self-evaluation by the property. Use this rating to help choose your stay! 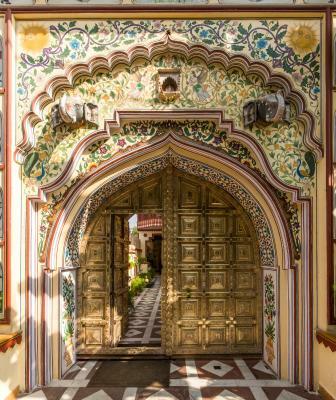 One of our top picks in Jaipur.Built in traditional style, Umaid Bhawan, located in Jaipur has beautifully carved balconies, attractive courtyards, open terraces, lovely garden and comfortable rooms with antique furnishings. 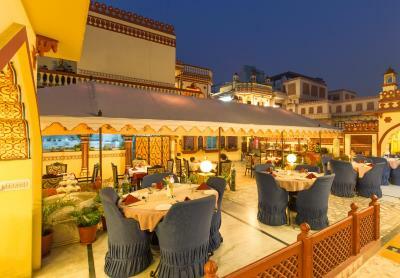 It offers a swimming pool with Fresco Miniature paintings and a rooftop restaurant. Free WiFi and parking are provided. 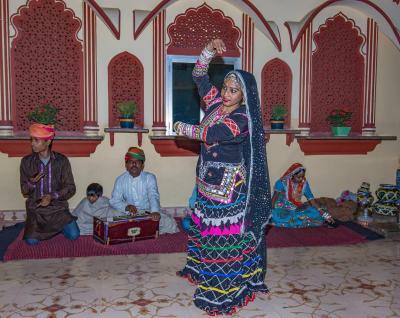 Umaid Bhawan is 0.6 mi from Sindhi Camp Central Bus Stand and 8.1 mi from Jaipur International Airport. 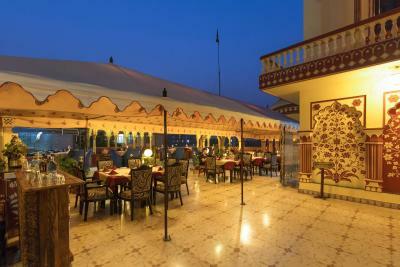 The hotel offers a free pick-up service from Jaipur Railway Station and the Central Bus Stand. 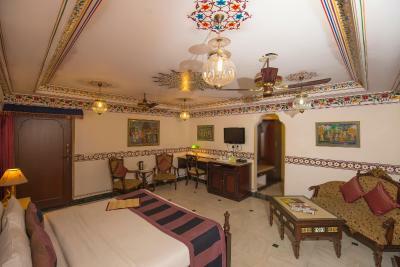 Furnished to showcase the skill and expertize of Rajasthani artisans, the air-conditioned rooms have a seating area and TV with cable channels. Hot shower facilities are in the private bathroom. Umaid Bhawan provides bicycle and car rental services, while daytrips can be arranged at the tour desk. For convenience, currency exchange and ticket services are also provided. 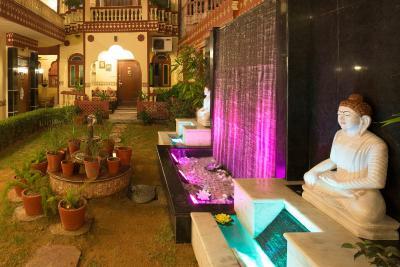 It has a souvenir shop and a well-equipped business center. 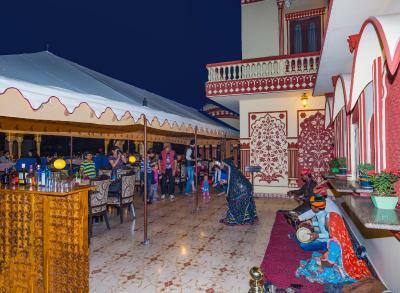 The rooftop restaurant features a live puppet show, and serves a variety of local dishes. Outdoor seating options are available. Bani Park is a great choice for travelers interested in sightseeing, architecture and ancient landmarks. 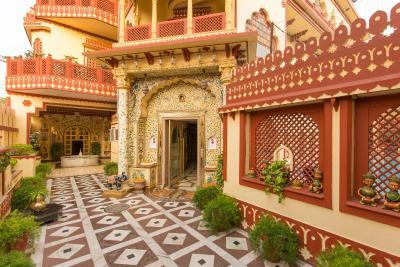 This property is also rated for the best value in Jaipur! Guests are getting more for their money when compared to other properties in this city. 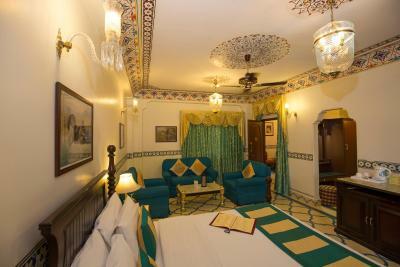 When would you like to stay at Umaid Bhawan - Heritage Style Hotel? Room provides cable TV and private bathroom with shower. Suite features a separate sitting area. Bathrobes are also provided. This room features cable TV and a private bathroom with a shower. 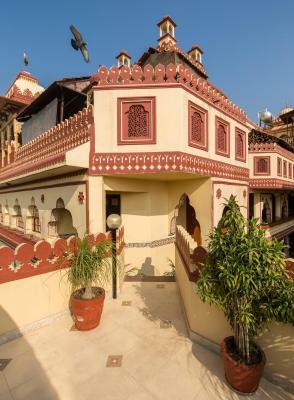 Please mention your arrival details at the time of booking under Special Remarks or inform the hotel directly at least 12 hours before your check-in time. This triple room comes with one double bed with one roller single bed. It has a balcony, seating area and cable TV. 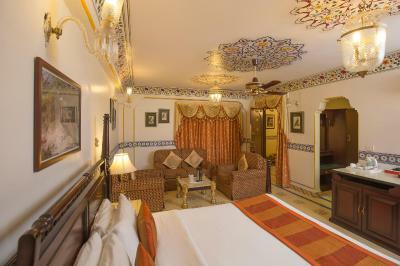 This triple room features a balcony, mini-bar and tile/marble floor. The bed for the third person is a roll away bed. 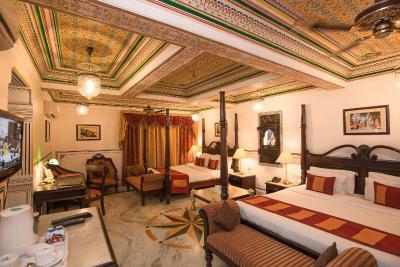 Umaid bhawan hotel is old heritage home converted into a hotel with 4 starfacilities. 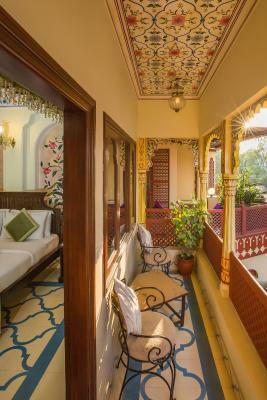 House Rules Umaid Bhawan - Heritage Style Hotel takes special requests – add in the next step! 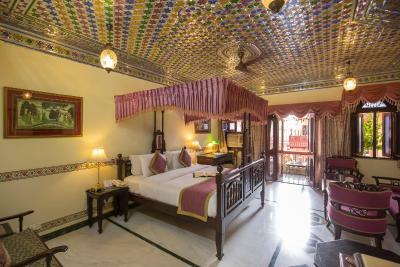 One older child or adult is charged INR 800 per person per night in an extra bed. 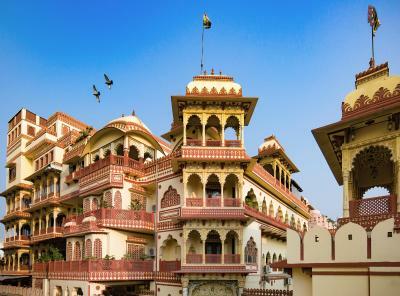 Umaid Bhawan - Heritage Style Hotel accepts these cards and reserves the right to temporarily hold an amount prior to arrival. 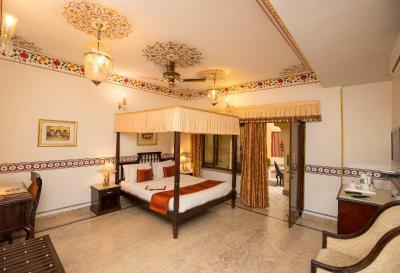 Please note that Royal Deluxe Triple Room and the Suite Triple comes with one double bed and one roll away bed. As a mandatory check in requirement, all foreign nationals and nonresidential Indians need to present passport and all Indian nationals need to present photo identity card at check in. Valid ID proof are voter ID, driving license and passport. PAN card is not valid ID proof and will not be accepted. Swimming pool timing will be 7 am to 8 pm and swimming pool users must wear swimming suits or swimming trunks upon entry into the pool. Clothing such as cutoffs, gym shorts, and underwear is not permitted as swimwear. 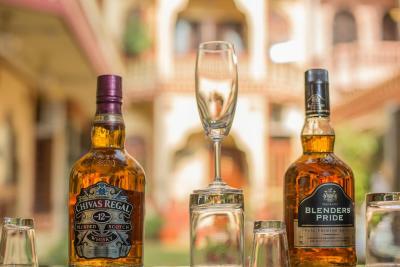 At check-in, all guests must present a valid proof of identification and of on-going travel. The rooms are not clean enough, the main receptionist is rude person and not qualified to dial with customers. Building and common spaces are nice. Not enough sunbeds at the pool. Attention and care of staff particularly Deepu in the restaurant. The pool area could use a few more places to sit. Nice hotel. 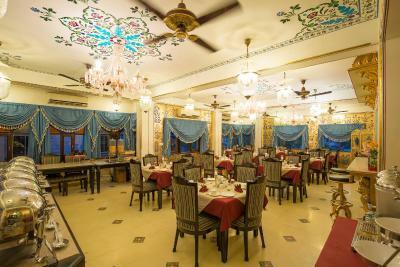 The staff were really friendly and the price of food is better than some of the surrounding hotels. 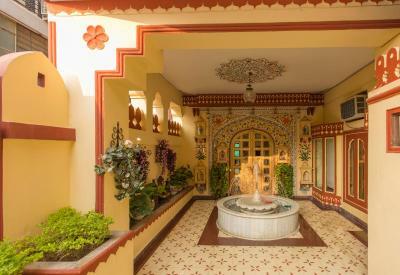 Fabulous restored and converted haveli full of interesting corners to sit and read in small courtyards and a garden surrounded by richly decorated walls, art and antiques, like he family home it once was. 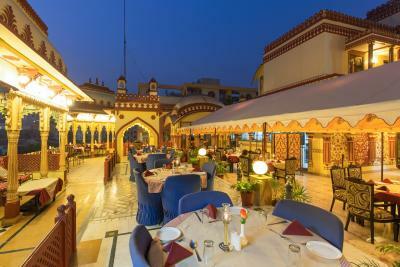 Delightful and attentive staff, particularly Deepu the reception manager and excellent rooftop bar and restaurant. 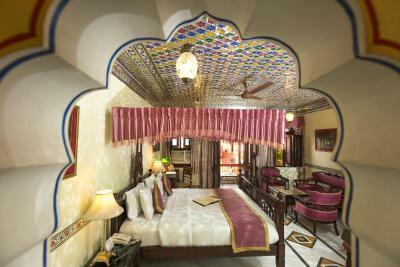 Rooms are spacious and comfortable and richly furnished in the appropriate style. There is an attractive pool, too, though we didn't have time to use it. 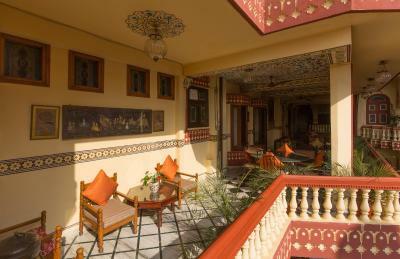 Location quiet and an exciting 20min tuk-tuk ride to the pink city or 40min taxi ride to the Amber Fort. Cleaness could be better. More importantly, a washing machine from the hotel was working all night long with a lot of noise, impossible to sleep. The hotel told us there were some work in the neighbourhood but we checked and it was very quiet. The noise was from inside the hotel. Very bad sleep quality. Note we were on a room in the last floor with the facilities . The hotel is really nice/beautiful. Excellent facilities especially with the pool and the rooftop. Attention to detail is incredible. Staff amazing and would definitely come back again! Dark rooms, kind of dated. Price is too hight for that. Nice place, comfortable, excellent restaurant at the top where we ate several times. Everything was perfect , loved our stay . Rooftop restaurant was great . They did a great job, I don't have a single complaint. This is a great property with immaculate interiors and courteous. The only not so good part is that the app road is too congested.